With the fall 2017 semester quickly approaching, the Comet Closet has launched a shoe campaign, "Kick It into High Gear," to support Comets who will soon be interviewing for their first job or internship. With this campaign, the Comet Closet team hopes to provide students in need with quality dress shoes that will, both figuratively and literally, allow them to walk confidently towards their career goals/ step into a new chapter of their academic or professional life. The money raised through this campaign will go to the purchasing of 25 new pairs of shoes. We are anticipating many more Comets utilizing the Closet this fall for their job interviews and internships, so any money that is raised through "Kick It into High Gear" will help us provide the footwear needed for success! What is the Comet Closet? The Comet Closet is a program that empowers UT Dallas students to achieve economic independence by providing the education, professional attire, and development tools they need to land their ﬁrst job or internship. Since the launch of our Impact UT Dallas crowdfunding campaign in 2015, The Comet Closet has organized an amazing team of student volunteers, developed a comprehensive inventory system and collected over 1,200 pieces of professional clothing. You took the opportunity to make an impression! Your donation of $10 will purchase supplies and materials that will clean and care for shoes donated to the Comet Closet. All $10 donors will be included in one of our social media shout-outs. Looking sharp! Your donation of $25 will purchase brand-new dress socks and hosiery that students will use to complete their look from the Comet Closet. All $25 donors will receive all of the above rewards as well as a personalized social-media shout-out. You’ve got style! 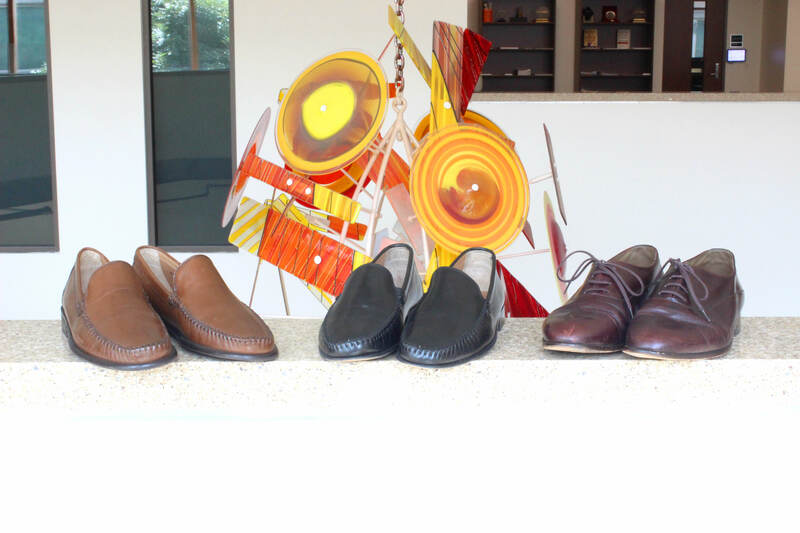 Your donation of $50 will purchase a quality pair of women’s heels or men’s dress shoes. All $50 donors will receive all of the above rewards as well as a handwritten note from one of our team members. Dressed to kill! Your $100 contribution will purchase a new pair of dress shoes and tailoring services for an outfit selected from the Comet Closet by a young man or woman preparing for an interview. All $100 donors will receive all of the above rewards as well as your or your company’s, name on our website’s list of partners and major contributors.